Congratulations to Daniel Foley and Dr Richard Doveston who were awarded the poster prize at the RSC-BMCS Fragment-based Drug Discovery meeting, held at the STFC Rutherford Appleton Laboratory in Oxfordshire, 3rd-5th March 2013. Daniel is a PhD research student working under the supervision of Profs. Adam Nelson and Stephen Marsden at the University of Leeds, while Richard took up a post-doctoral research position with Prof. Adam Nelson and Prof. Steve Marsden, in collaboration with GlaxoSmithKline in April 2012. 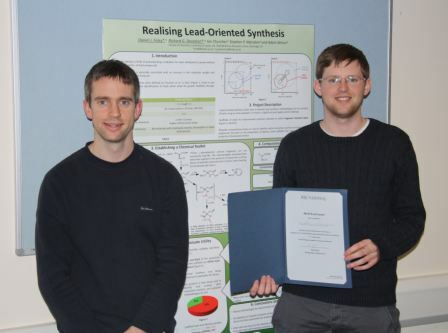 Their poster entitled ‘Realising Lead-Oriented Synthesis’ won the competition. Daniel receives a one-year personal subscription to MedChemComm. Photo provided by the University of Leeds. Also read the news item featured on the University of Leeds, School of Chemistry homepage. Congratulations again to Richard and Daniel on their award! The MedChemComm team wishes them all the very best with their future research work.